TORONTO, Ontario, Canada, August 14, 2012 (ENS) – The Ontario government is investing C$80 million to jump-start the widespread availability of electric car charging stations to make EVs more attractive to potential buyers. 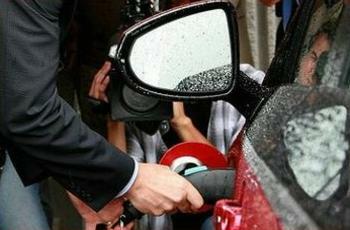 Premier Dalton McGuinty Thursday announced the new fund to spur the development and investment in charging stations as he plugged in an electric car at the Powerstream utility in Markham, just north of Toronto. “We’re taking the next step to ensure car charging stations are in the right place to power the next generation of vehicles,” McGuinty said. The McGuinty Government, together with Infrastructure Ontario, will encourage public and private sectors to come forward with proposals to build, test and expand the availability of recharging facilities. The province will provide seed money to the selected projects out of the C$80 million fund. Ensuring that charging stations are conveniently located will get more electric cars on our roads, help families save money and make our air even cleaner, the premier said. Ontario already offers people incentives to purchase electric cars, including an incentive of $5,000 to $8,500 and green license plates, which allow drivers to use the province’s network of High Occupancy Vehicle, HOV, lanes. The Ontario Ministry of Transportation is offering grants for small business lease or purchase of a hybrid or electric vehicle fleet. The program is a Canadian government incentive for reducing Canada’s commercial carbon footprint, but it is available to private consumers as well as non-profit organizations as well as businesses. Supporting the move to electric vehicles is part of the province’s plan to create jobs and reduce greenhouse gas emissions. The Electric Vehicle Incentive Program applies exclusively to those looking to purchase or lease a new, highway capable, plug-in hybrid electric vehicle or battery electric vehicle. Businesses or consumers interested in this program can receive up to $8,500 per vehicle towards the purchase or lease of up to five vehicles per calendar year. In order for businesses to receive their full incentive, fleets must be either purchased or leased for 36 months and registered in Ontario. Conventional hybrids, that run on a combination of a standard internal combustion engine and battery electric technology but are not capable of being recharged by plugging into the electricity grid, are not eligible for the incentive. In addition to the fuel and cost benefits of owning an electric or hybrid electric vehicle, the province has released new green licence plates for plug-in hybrid electric and battery electric vehicles. The Green Licence Plate Program provides those vehicles access to HOV lanes on 400 series highways and areas of high congestion, even if there is only one person in the car. In addition, GO Transit parking lots are beginning to offer parking spots where users can plug in and recharge their vehicles. Incentive and initial adoption programs are expected to grow as the Ontario government looks to increase the number of hybrid-electric and electric vehicles driven in Ontario to one in every 20 by the year 2020.